These highly adaptable birds have made a living around humans for thousands of years. House Sparrows are ingenious birds that have learned a highly specialized skill: how to open automatic doors. House Sparrows have been seen activating electric-eye sensors to fly into restaurants, supermarkets, and home supply stores. What will they be up to next? Most experts rate jays, crows, parrots, and mynas among the most intelligent birds — especially as problem-solvers or talkers. But there’s at least one ingenious bird that’s learned a highly specialized skill: how to open automatic doors. 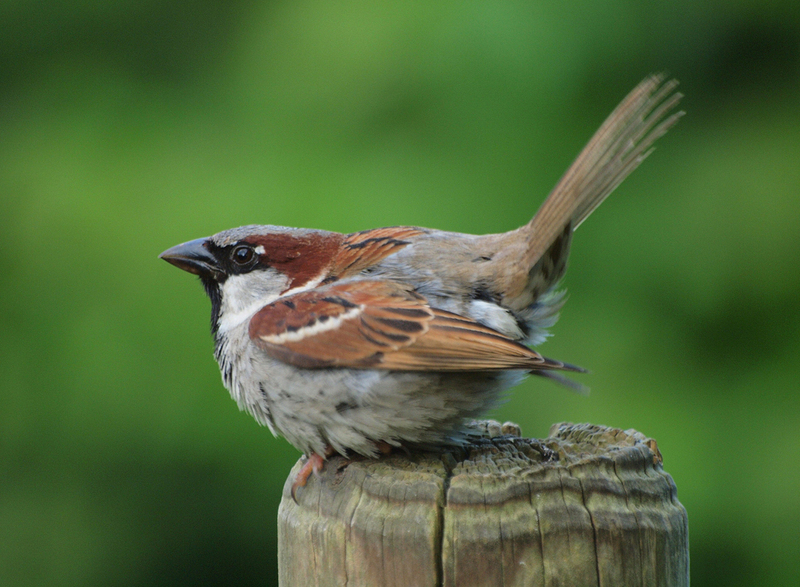 It’s the House Sparrow — a highly adaptable bird that’s made a living around humans for thousands of years. 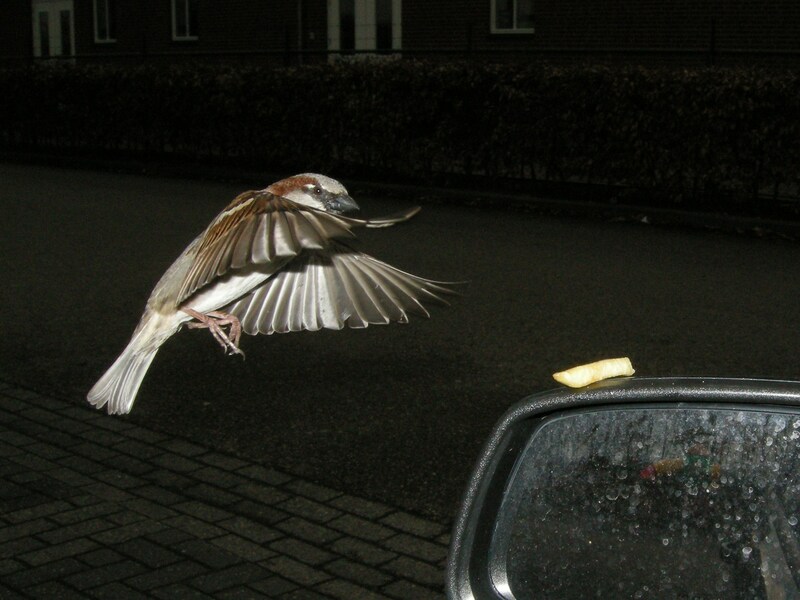 In the early 1990s, House Sparrows in Auckland, New Zealand, were seen activating a door’s electric-eye sensor to fly into a shopping mall. Another sparrow in Auckland, perhaps showing a more refined aesthetic, learned to hover in order to open two consecutive sets of doors to enter the cafeteria of an art gallery. 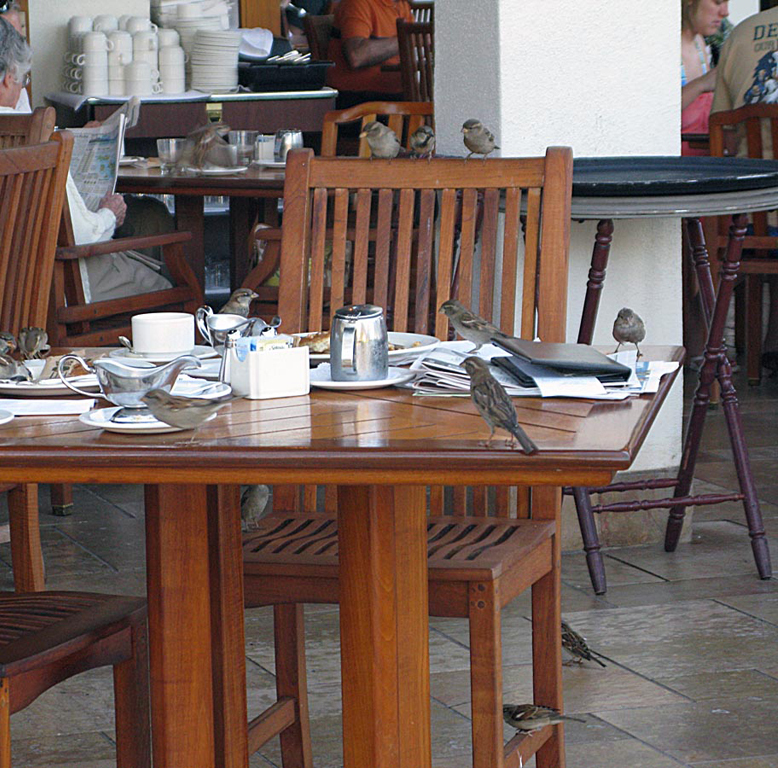 Other House Sparrows in New Zealand and nearby Australia were seen opening doors to a factory cafeteria, a fast-food restaurant, and two different supermarkets. Not all the smart House Sparrows live in the Southern Hemisphere, however. In the US, some trigger doors into big-box home supply stores to peck at seed spilled from bags. Who knows, maybe they’ll learn to open the seed bags, too. For BirdNote, I’m Michael Stein. Head over to BirdNote’s website for photos, videos, and more about the birds you heard today. Plus find links to lots of scientific resources and a whole section for teachers too! Start at BirdNote.org. Bird sounds provided by The Macaulay Library of Natural Sounds at the Cornell Lab of Ornithology, Ithaca, New York. Recorded by William Gunn. Swallows have also learned to operate doors.